Shadows reflect on the dirt road leading to the large land formation known as Castle Butte in the Big Muddy Badlands. The dirt road reflects long shadows of a sunny day in the Big Muddy Badlands. This long dirt road leads to Castle Butte. Castle Butte is a large land formation in the Big Muddy Badlands. A land formation is sandstone and compressed clay which jut out from the flat land of the prairie. 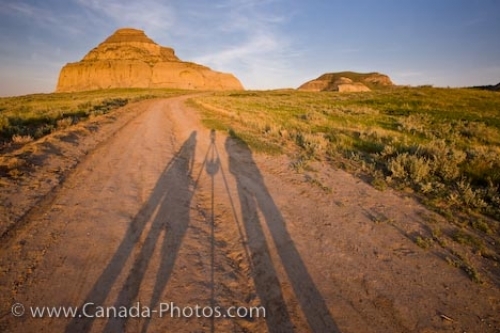 Shadows on the road leading to Castle Butte in the Big Muddy Badlands, Southern Saskatchewan, Canada.